In Kenya the government promises free education for all. They just need to provide a birth certificate. The first day the Kenya Rift Valley small one room class room in the has 250 applicants with only 50 desks. And 84 year old man shows up wanting to enroll. One of the teachers tries to discourage him telling him to go home and rest as he's pretty much has one foot in the grave, besides he needs a pencil. He leaves, but comes back again with the pencil. The teacher tells him he needs a uniform and shoes. His persistence impresses the head teacher who lets him to his delight join the class. In 1953 a violent uprising against the British colonial rule was led by the Mau Mau mainly from the Kikuyu tribe. More than a million members of the tribe were killed or imprisoned. Although the conflict was resolved the past was never forgotten. Kimani N'gan'ga Maruge (Oliver Litondo) has many memories of the abuses done to his tribe and his family. In a series of flashbacks peppered through out the film, tells of the miseries suffered in the hands of the British and the death of his wife and child. He comes to the school with a sincere desire to learn how to read despite the harassment from some of the parents and teachers. Despite his age his younger classmates enjoy the company and stories of their elder. Pretty soon the news of his enrollment is broadcast putting the head school teacher Jane Obinchu (Naomie Harris) to endure a long fight against bureaucratic rigidity. Jane's fight meets with deaf ears, who think that if they let one old man in the schools will be flooded with adults going to school with the kids. He tries the adult schools, but without success. Jane decides to make Maruge her teachers assistant and tutor him afterschool. The press descend on the town stirring up controversy with those who think that Maruge is taking away space and attention from their children and that the newspaper people are giving them money. The mass hysteria grows as Jane and Maruge are threatened with rocks, rumors and Jane getting transfered. That is until the children make their voices heard. Justin Chadwick previously directed The Other Boleyn Girl and screenwriter Ann Peacock has done The Chronicles of Narnia. The story offers a glance of Kenyan history and the conflicts that still remain today among those who fought the British and those that worked with them. The Kenyan country side is stark and beautifully photographed. Oliver Litondo gives a very moving performance and has great chemistry with Naomie Harris. There's a scene where Jane comments on the picture of Maruge's wife as being very beautiful, and he quietly says “yes” which is the emotional heart of the film. 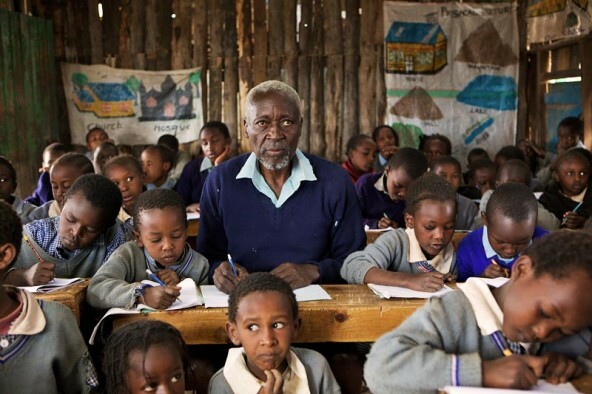 It's interesting to note that Kimani Ng’ang’a Maruge was a real person (he died in 2009) who’s in Guinness World Records as the world’s oldest person to start primary school.